The Arctic promises much in terms of energy resources, but huge technical, economic, environmental and social challenges will have to be overcome if the region is to be exploited successfully. Sean Ottewell reports. Russia, Canada, Denmark, Finland, Sweden, Norway and the USA, to name but a few, claim rights to the arctic territory. The reason is not hard to find: the US Geological Survey (USGS) estimates that the region contains 25 per cent of the world's undiscovered oil and gas. Although largely unexplored, the Arctic has been home to some petroleum companies for many years already. Much of this early work was driven by the oil crisis of the 1970s and today the Prudhoe Bay field in North Alaska, for example, is still a major source of oil for the US. At the same time, leaks from corroded pipelines at Prudhoe and the huge Exxon Valdez spill have raised serious environmental concerns about exploration activities on the top of the planet. So much so that in November the European Commission issued a report demanding that the highest environmental standards be observed in the Arctic, along with full protection for the rights of the indigenous population. In particular, the Commission has urged the European Union to engage in long-term cooperation with other countries with interests in the Arctic, particularly Norway and Russia. "Arctic resources could contribute to enhancing the EU's security of supply concerning energy and raw materials in general. However, exploitation will be slow, since it presents great challenges and entails high costs due to harsh conditions and multiple environmental risks," noted the report. The result is that exploration companies are putting a great deal of time, money and effort into planning their Arctic efforts. Shell, for example, is developing sophisticated spill technology and reducing the size of drillships in order to minimise impact. In terms of spills, the company ensures that underwater pipelines are buried many metres below the seabed so that they cannot be broken open by floating ice. Leak detection technology and multiple valves systems will stop any flow of oil if a drop in pressure is detected in the pipes. Should leakage occur, a tool developed with the help of Finland's Environmental Institute gets around the problem. It helps remove oil that has come to rest on blocks of ice by moving the ice up and down to dislodge the oil into the water where it can be taken away by a kind of conveyor belt. Another innovation is the Bully Rig drillship concept which was developed by Shell engineers to minimise impact while accessing resources. It is 25 per cent smaller and 60 per cent lighter than comparable capacity drillships, making it more energy efficient and so less polluting. It also has an ice-class hull that puts increased protection between the sea and its cargo. In terms of broader social and environmental issues, Shell has signed a collaboration with the World Conservation Union (IUCN) to gain access to advice for future projects in sensitive areas such as the Arctic. The IUCN already advises the company's engineers on factors such as reducing noise from pipeline construction and guarding against collisions by measures such as setting speed limits for ships and placing observers on vessels. Meanwhile, ExxonMobil has developed many of its recent Arctic capabilities during its involvement with the Sakhalin Island oil field in Russia. In particular, its subsidiary Exxon Neftgas Limited (ENL) achieved a milestone in 2007 when it hit its target of 250 000 barrels of oil a day from from the offshore Chayvo field in the Arctic. In winter, the field can become a sea of moving ice up to six feet thick. It's also subject to gale-force winds and seismic activity as well as negative-digit temperatures throughout much of the winter. "We've had to face every challenge imaginable in this project - from the harsh conditions, to the remote location with very little infrastructure, to the complex regulatory structure," said Steve Terni, chairman of ENL, in company magazine The Lamp (issue 2, 2008). "But we've assembled truly multifaceted, international project and production teams to take on these challenges, including our drilling organisation, whose performance has been truly outstanding," he added. To reach Chayvo's offshore oil, ENL has drilled horizontally from the land, a technique known as extended-reach drilling, which, although technologically challenging, uses a smaller environmental footprint and is more efficient and cost-effective than depending solely on offshore drilling platforms, Terni says. One key to ENL's success is Yastreb, the world's most powerful land-based drilling rig. By June 2008, Yastreb had drilled 28 wells ranging from five to more than seven miles in total depth. Seven of these broke the world record for the longest extended-reach wells ever drilled. None of this has been easy. Terni likens drilling six miles from land beneath frigid waters and floating icepack to "threading the needle in the proverbial haystack, from way across the farm, in a blizzard." To tap the outer reaches of the field, ENL has also used an offshore platform, the Orlan, named after the Russian sea eagle, which was retrofitted to withstand the area's turbulent storms and seismic activities. Through the application of cutting-edge technology, including the combination of ExxonMobil's extended-reach drilling and the company's Fast Drill Process, ENL has been able to drill wells in nearly half the time anticipated. Sakhalin is not ExxonMobil's first experience in the arctic. The company pioneered an ice-breaking supertanker, the SS Manhattan, in 1969, provided significant research and engineering for the Prudhoe Bay field in Alaska, and has done extensive work in Canada, where ExxonMobil operates the Hibernia platform off Newfoundland - the first and only iceberg-resistant offshore structure in the world. But Sakhalin has presented some of the most extraordinarily extreme work conditions the company has ever undertaken and is helping it to prepare for deeper and colder conditions that will be found further into the Arctic frontier. One of the big hopes for the Arctic is hydrates, the ice-like solids in which water molecules trap natural gas molecules. The US Department of Energy (DOE) estimates that they could account for 11.5 per cent of all undiscovered gas resources in the country. On 13th November, the DOE issued a new report suggesting that Alaska holds enough recoverable natural gas trapped in ice to heat more than 100 million homes for ten years. 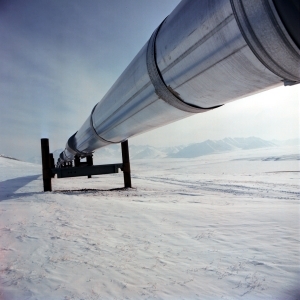 The report found that Alaska holds 85,400b ft3 of natural gas recoverable with today's technology. As the industry continues to invent new technologies to access further natural gas hydrates, that number could rise significantly. "The assessment points to a truly significant potential for natural gas hydrates to contribute to the energy mix of the US and the world," said Dirk Kempthorne, the then US secretary of the interior. The report was published as a nine-year research programme into hydrates enters its last year. Run by the DOE, the goal is to characterise the large in-place methane hydrate resource on the Alaska North Slope (ANS) and conduct field and lab studies to determine the potential for hydrate to become a viable part of the overall energy supply. The research team includes the DOE, BP Exploration Alaska (Fig.1), the USGS, plus a host of seismic, drilling, geochemistry and well support companies. Back at the project's start in 2001, BP Exploration Alaska proposed to provide a state-of-the-art 3D seismic survey over its Milne Point production unit to provide a starting point for a full evaluation of the feasibility of commercial production from Arctic hydrates. The initial phases of the effort fully integrated detailed geophysical interpretation and modelling, regional geologic characterisation of the prospective hydrate-bearing units, and advanced reservoir and economic modelling, to select a location for drilling, coring, and potential production testing. verall the project will be a critical first step in the determination of the commercial viability of methane production from Arctic hydrate deposits. The project will greatly advance the tools and techniques used to delineate specific hydrate prospects and to model the potential productivity and commercial viability of those prospects. The project could also provide the first extended production testing of a US gas hydrate reservoir and yield insight into the relative merit of various contemplated production and stimulation approaches. The project is currently within phase three of a planned four phase (phases 1, 2, 3A and 3B) project. Phase 1 resulted in the delineation and characterisation of 14 discrete gas hydrate accumulations within the Milne Point Area containing up to 600b ft3 gas in-place. Phase 2 provided detailed analyses and evaluation of the prospects identified in Phase 1, as well as the regional resource potential, in order to develop a detailed and specific plan for potential Phase 3 field operations. BP is currently in the process of reviewing the feasibility package for Phase 3B and approving authority to move the project forward into a long-term production test phase.